Opposition Leader Dr. Denzil Douglas is the latest in what is becoming a growing list of notable citizens condemning the Timothy Harris-led Team Unity administration for a lack of accountability, transparency and overall good governance. Coming on the heels of a scathing commentary by Queens Counsel Charles Wilkin and comments by political and social activist Dwyer Astaphan citing the government’s failure to fulfill its campaign promise of good governance, Dr. Douglas on Wednesday charged that the government is in fact taking deliberate steps to prevent anti-corruption bodies from uncovering alleged wrong-doing. “I want to take us back to when the Team Unity Coalition took government campaigned on good governance but it is very clear that they were never serious about good governance practices here in St. Kitts and Nevis. The Integrity in Pubic Life Commission was in fact installed after three long years of waiting, but we have recently heard that the Commission has not been able to function. “Why? Because Dr. Harris has withheld the necessary funding in order to finance the operation of this Commission. We believe, and I’m sure many members of the Commission also believe and the citizens of this country believe that it is a deliberate strategy on the part of the government to deprive the Commission of its investigative powers; because naturally the members of the government would have to declare their assets and we would be able to discern, observe and look at what they had four years ago and what they possess today- four years after in government. 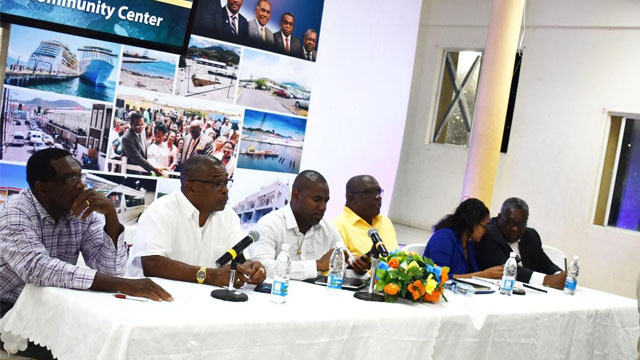 Citing a non-active Public Accounts Committee, Dr. Douglas opined that Team Unity never intended to follow through with its promise of transparency and accountability. According to the former Prime Minister, the government’s refusal to allow the IMF to publish its 2018 country report on the St. Kitts and Nevis economy and the obscurity with regard the Citizenship by Investment Program are clear indications that the government is operating under a veil of secrecy and deception. Labour parliamentarian Konris Maynard also outlined critical areas where he felt the government had failed to deliver good governance. He said until the situations are reversed, the government ministers should not be allowed to get an increase in salary. “If you refer to page 42 of their [Unity’s] manifesto it says ‘create an independent electoral office absent of political interference and direction’ – fail, non-existent. Passage of campaign finance reform legislation- big fail. In fact the only campaign finance discussion that has been had, is that the Prime Minister has been named in a London court where bribes of shoes and watch and food seem to have been the precursor to receiving campaign finance if a project was allowed to go through- major fail. “Reform the Electoral Commission and the Constituency Boundaries Commission- fail. In fact they have done nada when it comes to the Boundaries Commission or the Electoral Commission. “We need to be certain that our public officials are acting above board and not living under the table, and if they continue in the way we see they have over the last four years we cannot in good conscience support any effort or any attempt for ministers to increase their salaries, while we’re seeing across the board in this country people are suffering.